Most people figured this would be the case, especially with two weeks before the final race, but now it’s official. Will Power was cleared after having concussion-like symptoms and will race in Sonoma. The important parts about all of this are (a) Power is okay and (b) he can participate in the test on Thursday at Sonoma. That’ll not only help us get an early indication of how this final race is likely to play out, but it’ll also give Power a chance to find that extra speed he’ll need to take the title fight to Pagenaud. There’s just a 16 percent chance that the points lead (and championship) will shift to Power in the last race of the year. Pagenaud has looked strong all season leading wire to wire and sits with a 43 point lead heading to Sonoma. That’s the fourth biggest lead a driver has held heading into the last race in the past eleven years. Of the drivers who had a larger points lead, only one ended up losing the title: Montoya in 2015. I went back and looked at the results of the past eleven championships, noting who was leading the points heading into the final race and who ended up winning. The seasons highlighted in yellow are ones in which the driver who led the points before the last race didn’t win the title. In all seven “yellow” seasons bar 2015, the gap before the last race was under 20 points. Montoya’s loss in 2015 was a fluke, not the norm — at least not yet. Double points in the final race is still a fairly new concept and it’s yet to be seen if it will change this theme. That’s bad news for Power who needs to come back from a deficit closely resembling Dixon’s last year. He’ll be looking for Pagenaud to either (i) get into some sort of crash and drop back or (ii) have a DNF. While both of these are seemingly long-shot scenarios to happen, they’re more likely than Pagenaud simply having a bad race on his own. If Power or Pagenaud won the race, that driver would have the most first place finishes and win the championship. If neither driver wins the race and Power doesn’t come in second, Pagenaud wins. If neither driver wins the race and Pagenaud comes in second, he wins. 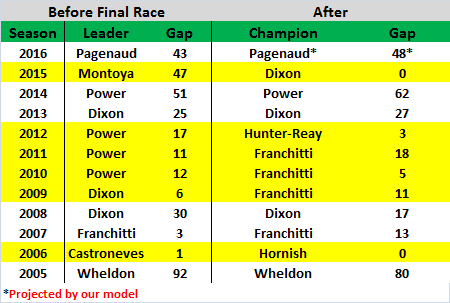 If neither driver wins the race and Power comes in second, Pagenaud and Power will be tied in second place finishes, and Power will win based on third place finishes, so long as Pagenaud doesn’t come in third. If one of those scenarios doesn’t happen, well, we’ll figure that out when the time comes. Luckily (unluckily?) we probably won’t have to deal with a tie in the championship. There’s just a 0.56% chance of the championship being tied after Sonoma. Our IndyCar Championship model has been updated and will now run 10,000 simulations of the remaining races instead of the previous 1,000. This will help improve the accuracy of the model, especially early on in the season when more championship possibilities are at play. As it sits right now, there are only two contenders for the championship, so simulating the remaining race 1,000 times works just fine. It’s really more of a benefit for next season than this one. The graph on the site has been updated after running these 10,000 simulations. Watkins Glen was pretty much a disaster for Will Power. He got taken out of the race after coming together with Charlie Kimball on lap 38, resulting in a 20th place finish for the Aussie. Not only did the crash end his race, it may have ended his championship hopes too. Here’s how the odds look with one race remaining. Pagenaud pretty much has this locked up barring a DNF out in Sonoma along with a top-four finish for Power. You can read about how our model works here, and the latest forecast can be found here. What If Power Had Started At St. Pete? If you haven’t already read about how we’re forecasting the 2016 IndyCar Championship, you can read about it here. Our latest forecast is here. One of the benefits of having a model is that we can play with it to see how the championship odds would be different if certain events happen/happened. That’s what I’m going to be doing today.